Savings bonds are a way for average Americans to buy U.S. government debt. 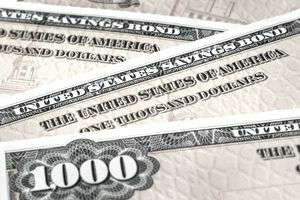 Most savings bonds have a “face value” between $50 and $10,000. Currently, U.S. Savings bonds are considered one of the safest investments that you can buy, because they are backed by the full faith and credit of the U.S. Government. Basically, the government would have to fall apart for your bonds not to be honored. But, savings bonds can still be a little bit confusing. Typically, this is how they work. The face value of the savings bond is what the bond is worth when it’s mature. You buy the bond for less than (usually half of) the face value. For example, a series EE bond that has a face value of $50 can be bought for $25. A series EE bond will reach full face value after 20 years and will stop earning interest after 30 years. This type of bond must be owned for at least one year before it can be redeemed and has to be owned for at least five years to be redeemed without any penalty. The penalties are usually small, but if you want to get your full money’s worth then you need to make sure you hold the bond for 5 years. One of the most confusing things about savings bonds is figuring out how much they’re worth before they hit their full face value. Luckily, online tools make it easy to calculate the value of savings bonds. So, if you own savings bonds, how do you calculate the value if they aren’t mature yet? In order to calculate the value of your savings bonds, you’ll need to gather some information. Once you have this information you can use a savings bond calculator all to find out how much your bond is worth right now. There are two main sites that you can use to calculate the value of your savings bonds. The first one is the government site treasurydirect.gov. Since this is a government site and bonds are government-issued, this is the site I personally use. How to find the interest to report to the IRS – if you want to do that. You can choose to report as you go, or when the bonds mature. The actual calculator can be found here. If you have the information from the list above, you can go directly to this calculator to find out exactly how much your bond is worth right now. The second place to find out how much your bond is worth is at savingsbonds.com. This is a commercial site but has a very straightforward calculator that’s easy to use. One thing that you should know about savings bonds, is that the interest rates are very low at the moment. According to the US Treasury website, EE bonds that were sold between May 1, 2014, and October 31, 2014, will earn an interest rate of half a percent. But there is a weird rule with savings bonds, which I mentioned earlier. The Treasury Department has made a promise to double your investments in EE savings bonds in no less than 20 years. So, if you buy bonds, it’s a good idea to have a plan to hold them for a full 20-year timeframe. Because if you redeem them early, you only get the interest rate that was guaranteed up until that point, which will be significantly less than if you wait the full term. You really want to think of savings bonds as part of a long-term investment strategy. While I can’t give you investment advice, it’s widely regarded that savings bonds are one of the safest ways to invest your money. So, if you’re willing to wait the 20 years for them to double in value than they can be worth buying. What Is the Best "Safe" Investment?